Posted by Rachel Goldner at 3:00 pm, January 23rd, 2012 under Free Stuff, Pie Face. Do they mean the midnight of Thursday till 12am Friday? I walked by there this morning and they were handing out coupons for free capuccino. I know I forgot a p in cappuccino. I haven’t had any coffee yet today. Just came back from there. Expect very spotty service! The girl who took my order bagged my lunch wrong and also forgot one of the items.. Luckily I found out before heading back. Also if you are used to true Australian/NZ pies, these tastes a little different I think they use a lot more butter on the crust, which is good lol. When I went there was no line but still took them 5mins to process the previous orders and take mine. Also they don’t have carry out bag with handles, you either have to hold it wih ur whole arm, or pinch carry the paper bag, which is very annoying. 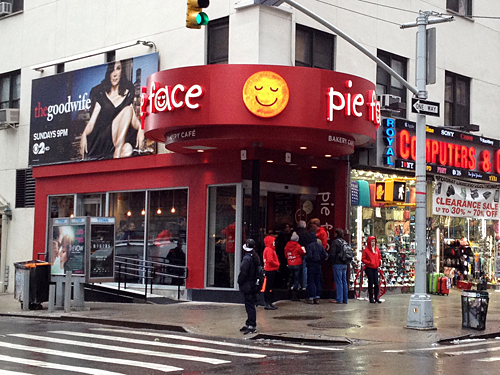 But I have to say the pies are delicious, and it’s Ye only place in midtown where I can get a slice of home. Stopped in last night and again this morning (I’m a glutton what can I say). Last night – A few people ahead of me in line…At 7:30PM they were out of Soup and out of “Smash” so it was pies and pastries only… Had the Chicken&Mushroom with a mini Pear& Ricotta pie. One savory pie without smash will definitely not be a satisfying lunch for people around these parts but the flavor was very good. Actually, both were good. I think I favored the sweet option despite its skewed price point. And, as @eknick said above…tons of butter. This morning – no line. Got the bacon, egg & cheese pie. Fluffy eggs, good bacony/cheesy flavor. Kind of like a fluffy omlette in a butter crust. Definitely preferred this to the one last night. Overall – Good variety of options (more than just what is on the printed menu). Everything was hot and ready to eat so nothing required extra time or anything like that. Service was slowish but it was their 2nd day after all so I wont judge that too harshly yet. One of the biggest (and silliest) complaints is that the display/order counters are taller than the 3 cashiers I have seen there so far….makes for some awkward ordering. I thought the service was alright but I didn’t really have any place to be so I wasn’t in any rush. I only tried the breakfast pie and thought it was delicious. The eggs were perfectly fluffy and the buttery crust was probably my favorite part! I’ll certainly go back to Pie Face soon to give that Steak and Mushroom pie a shot! All future reviews on Midtown Lunch must provide a description of the takeout bag. Handles or no handles? Well, as of about 2pm they are out of free pies. They were still giving out some coupons for free coffee, but not to everyone… it was extremely random.